After a wonderful first day, the Jesus and Brian conference began again on Saturday morning with a paper from one of the real gurus of Jesus films, William Telford. He had a superb series of reflections on the ways in which the Life of Brian parodies the Jesus films, and his paper was superbly performed. He does not just read his paper, in the manner all too common in the guild, but he acts it. It was compelling stuff. Jesus", in which first Philip Davies and then James Crossley took a more subversive look at the film and argued that it is not quite so benign in its intentions as it is depicted by Burridge and others. After a coffee break, Helen Bond gave an eloquent and fascinating paper on laughing at crucifixion. The quality of the papers continued to be high. Guy Stiebel from the Hebrew University of Jerusalem talked about "Romanti Ite Domum: Identity and Expressions of Resistance in Judaea", with fine use of Powerpoint, including one picture of some kind of ancient phallus, which caused lots of sniggers (and some remarks about "bigus dickus"). Last night I blogged about my hunger after the canape reception, but today I was forced to eat my words after we were treated to a delicious sandwich lunch, and I was even invited into the speakers' room where I got to hang out with the swells. I do miss nice British sandwiches, so it was a treat, and I sneaked one last one in to enjoy with the first afternoon paper, Steve Mason on "What have the Romans ever done for us? ", a really fascinating study of first century politics and relations between Judaea and Rome, with superb use of Powerpoint (and it's not often that you can say that). After Steve Mason came one of my favourite scholars, Paula Fredriksen. I must admit that I still feel a little starstruck whenever I talk to her. Her paper was called "Are you a virgin? Biblical Exegesis and the Invention of Tradition" and the best use of clips from the film -- each short clip was followed by some reflections on the Biblical text. The last session of the day kicked off with a fascinating piece by David Shepherd, who explored another Biblical parody, Wholly Moses, starring Dudley Moore, which was something of a critical and commercial failure. Shepherd showed several clips and explored the difficulties with the film. The second of his clips, in which Dudley Moore as Hershel "does God" after having come down from the mountain, I found hysterically funny, so much so that when my head fell backwards I knocked someone's bag off their desk. The last paper of the day was given by Aaron Rosen, who talked about "Sonofagod: Images of Jesus in Contemporary Art". There was just enough time in between the end of the formal programme and the conference banquet for a swift pint in a German style bierkeller with big screens showing the World Cup, and we just caught Argentina beating Iran 1-0 in the closing minutes. Joan Taylor kindly took the picture. I was delighted to get the chance to chat to Cleese, who was utterly delightful. At the dinner itself, the top brass sat on high table with Cleese, with Fredriksen to his left, Griffith-Jones to his right, and Ehrman opposite. The food was excellent and the wine flowed pretty freely. Afterwards, Cleese gave a short speech and then invited attendees to ask him questions about the film, with Michelle going around with the mic. Cleese dealt graciously and amusingly with each of the questions and I could have listened to him all evening. A really marvellous occasion. Sadly, this wrapped up my attendance at a wonderful conference. I had a conference in Roskilde, Denmark, to get to, on Luke's Rewritten Bible (on which, more anon), so I jumped on the tube to Victoria and the train to Gatwick, in time to grab a couple of hours' sleep before my early morning flight. The conference did continue today (Sunday) with several great speakers including A-J Levine, Adele Reinhartz and Bart Ehrman. I would also really have liked to hear Richard Burridge's talk about the Malcolm Muggeridge and Bishop Stockwood programme. Perhaps I'll be able to catch up via the conference video. As far as I could tell the whole thing was being video-ed. It's appropriate to conclude with a picture of Joan Taylor, who did so much hard work to make this conference a success. It was a brilliant idea for a conference, superbly organized, with tons of amazing papers from top people. And, of course, John Cleese. Did I mention that I met John Cleese? It's not every day that you get to go to a conference on Monty Python. Jesus and Brian Or: What Have the Pythons done for us? 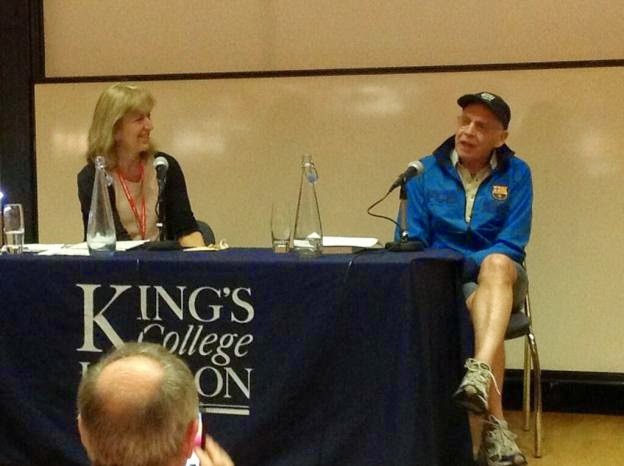 is the mastermind of Joan Taylor at Kings College, London, with support from Richard Burridge. The focus is Monty Python's Life of Brian (dir. Terry Jones, 1979), and how it interacts with scholarship on the New Testament, Christian Origins, the Historical Jesus and the history of early Judaism. The conference began today at King's College London and continues for the next two days. As a long time fan of Life of Brian, and with an interest in Jesus films, I could not resist the opportunity to make it to this one. Luckily, I have a conference in Denmark beginning on Sunday, and the chance to stop off in London on the way there made it irresistible. Having said that, travel was not straightforward. We had a flight cancelled on Wednesday evening and another on Thursday morning and only made it in in the early hours of Friday morning. With no more than a few hours sleep over the last three nights, this does make it more of a challenge than I had expected, but I have no doubt that it will be worth it. The conference began at around 4pm today. Immediately one could see several scholarly celebrities around -- A.-J. Levine, Bart Ehrman, Helen Bond, George Brooke, Martin Goodman, Adele Reinhartz, Philip Davies, James Crossley, Eddie Adams, and so the list goes on. Kings College is right in the heart of London, on the Strand, with theatres and swanky restaurants all around. As long as you are not in a car, it's a fantastic location for a conference. I tubed in from Heathrow to Covent Garden and had just a five minute walk. Joan Taylor introduced the conference with a lively and witty piece on "the Historical Brian". She mentioned her delight that the Pythons themselves had expressed enthusiasm about the conference and her amazement to get a phone-call from John Cleese. She looked also at the comparison between the Life of Brian and the Hollywood Jesus films, and especially King of Kings. Martin Goodman then spoke about "The Life of Brian and the Politics of First Century Judea" and there was a lively Q&A session afterwards. George Brooke spoke third, on "Brian as a Teacher of Righteousness", and got the best laugh so far when he said that Brian "puts the mess back into messianism". The audience were taking a little while to warm up, but they were gradually getting there. From this first session we went upstairs for a nice wine reception, with a few of those posh little canapés going around on trays, the kind where you need about five hundred to fill you up. As it turned out, this was the only food of the evening, so it was important to grab as many as you could, and I'm not sure that I was quite up to the job. Rick Trainor, Principal at Kings, gave some opening remarks, and uttered the heresy that he had not in fact seen the film! After the reception, we returned to the lecture theatre for the highlight of the day. In fact, I'm sure it will prove to have been the highlight of the whole conference. Richard Burridge interviewed Terry Jones and John Cleese for an hour. It was an utterly compelling session. I have to admit that I was a little starstruck. John Cleese took the lion's share of the discussion and pretty much everything he said was quite fascinating. Cleese expressed genuine pleasure that the film had resulted in a conference like this, and said that it might just be one of the best things the Pythons had done. He talked about how good a director Jones was, adding that it was because he was a megalomaniac. He talked about an alternate story line that came to nothing about Brian (or some other character) failing to make it to the last supper. He spoke in the most disparaging way about the media ("second rate scum") and expressed little surprise when Burridge mentioned how little interest they had shown in this conference. Jones did do a Mandy voice at one point, and he generally seemed rather chuffed with the whole discussion while broadly happy to let Cleese dominate. Burridge did a fine job of allowing them to relax and chat while at the same time reining them in a bit and asking some very interesting questions, including a discussion of the now famous Stockwood and Muggeridge discussion of the film, with Cleese and Palin, on Tim Rice's programme. Cleese said that he was an admirer of Muggeridge and felt sorry for him that his responses to the film were so poor. If anything, the discussion with Cleese and Jones was too good. The hour went too quickly, and I could have continued listening for hours. There followed an opportunity to watch the film (via DVD projection) in the same theatre, but over half the audience including most of the top brass flocked out, perhaps having realized that two or three canapes is not quite enough for dinner, and going in search of food and drink. If the timing was not ideal, it was still nice to have a chance to watch the film again, all the more so in appreciative company, and good to brush up on it ahead of a whole raft of lectures tomorrow, all of which look like they will be fascinating. The first day of the conference was every bit as good as I thought it would be and better. Richard Burridge has an article in the Church Times here: Is he more than a 'naughty boy'? and there is a pre-conference podcast here. 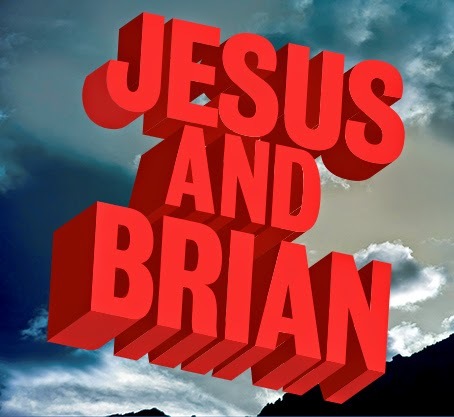 I will continue to live-tweet the conference tomorrow, along with several others, and all your reactions, using the #JesusandBrian hashtag. Jesus and Brian Conference in London - tickets still available! Jesus and Brian: What did the Pythons ever do for us? Full details are at the link above. As a life-long fan of Life of Brian, I am really excited about this event. In fact, I booked my ticket back in March, as soon as I heard about the conference. I hope to live-blog most of it too (though sadly I'll have to miss the Sunday because I'll be heading to Denmark for another conference, on more of which anon). There is a stellar cast of scholars lined up to speak at the conference, including Paula Fredriksen, Adele Reinhartz, Helen Bond, Bill Telford, Bart Ehrman, James Crossley, Philip Davies, Martin Goodman, George Brooke, Steve Mason, Amy-Jill Levine, as well as locals Joan Taylor and Richard Burridge, and so the list goes on. While the programme lists Richard Burridge engaging in a "conversation with mystery guests" for the Friday evening, I have it on good authority that the guest will be Terry Jones himself! Julian Doyle (editor) is also lined up to appear on the Sunday. And there is another "mystery guest" for the Saturday evening who can't yet be named. Booking details are here. I look forward to seeing lots of you there for what is likely to be a really wonderful event.